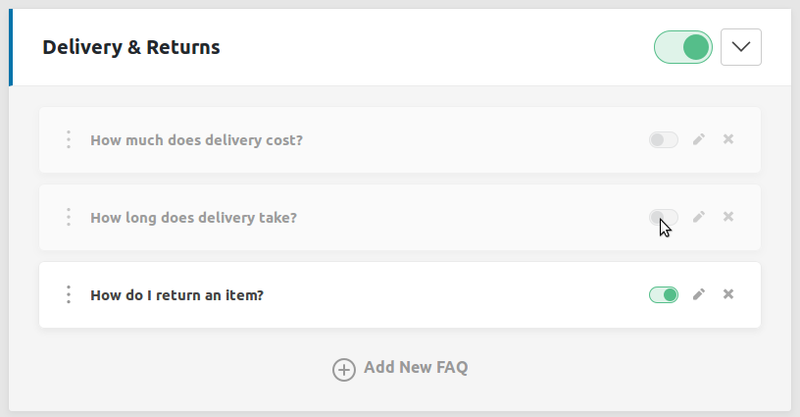 The Heroic Frequently Asked Questions (FAQs) plugin adds an easy-to-manage FAQ style section to your content. From Zip File: In the WordPress admin panel navigate to Plugins > Add New, select the ‘Upload’ and browse to the zipped plugin file, and hit install now. FTP Upload: Using your FTP program upload the un-zipped plugin folder into the /wp-content/plugins/ folder of your WordPress installation. Once the plugin has been installed, you need to activate it. 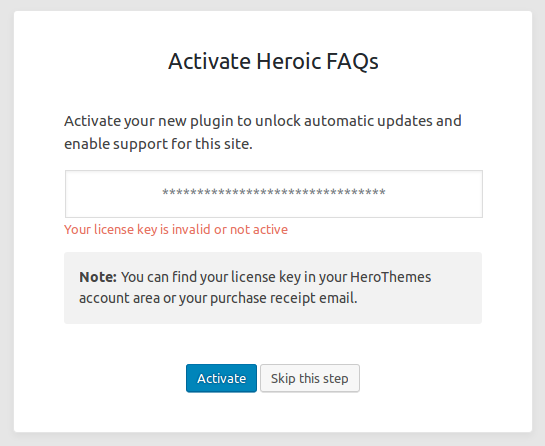 Go to Plugins > Installed Plugins and activate the Heroic FAQs. When you first activate the plugin, you will be taken to the FAQ builder. If required, you will be prompted to enter your license key to enable automatic updates and support for the current site. It is possible to skip this step, but you will be reminded that no license key has been entered. The FAQs are organized into groups. FAQ Groups can contain one or more FAQ items. The whole group is then placed in your website content. To get started, click on Add FAQ Group. Enter a name for the group and click save, this name will not appear on the front of your site, it is only used for organizing your FAQs. Once you have created an FAQ Group, you can add individual FAQ items to the group. Click on the Add New FAQ button within the FAQ Group you wish to add an FAQ item. A new FAQ will be added to the group and you can edit the Question text. Next, enter the answer. The answer area is a WYSIWIG editor, so it’s possible to add rich text and a multi-line response. For FAQ groups it’s possible to rename and delete the group after confirmation from the dropdown on the right of the group. Note that deleting the group will also delete all the FAQs contained in that group as FAQs cannot exist outside an FAQ Group. By default and when the FAQ builder loads, FAQ items will be collapsed. You can expand an FAQ by clicking on the question text. Clicking the pencil icon will load the WYSIWIG editor. Clicking the X icon will delete the item after confirmation. The toggle switch on the FAQ Group and FAQ items can be used to stop individual FAQs or whole FAQ groups from appearing on your site. This is useful if you want to hide FAQ responses without deleting them. Note: The WordPress API or 3rd party plugin may still expose hidden FAQ content, so it is not advised to rely on disabling FAQ items for security. 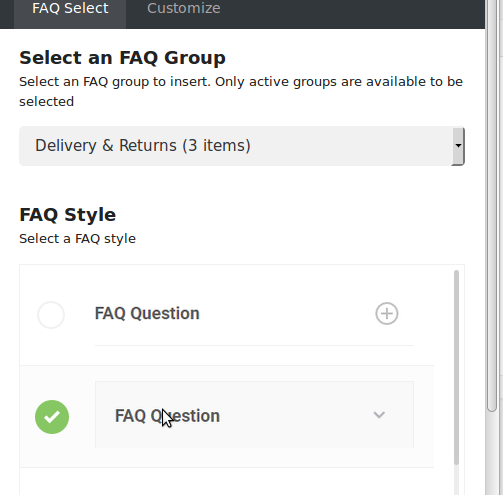 FAQ items within the group can be reordered by clicking on the three dots to the left of the question and dragging it to a new position in the list. After the FAQs have been created, they can be added to any post or page content using an FAQ Block. 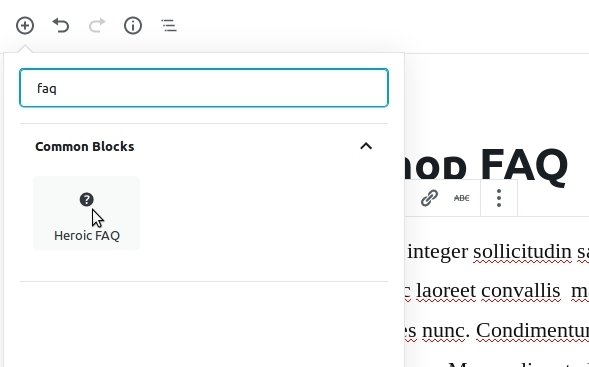 To insert an FAQ, while editing content, select the + icon at the top of the editor window, select the Heroic FAQ Block (under Common Blocks) to add it to your content. 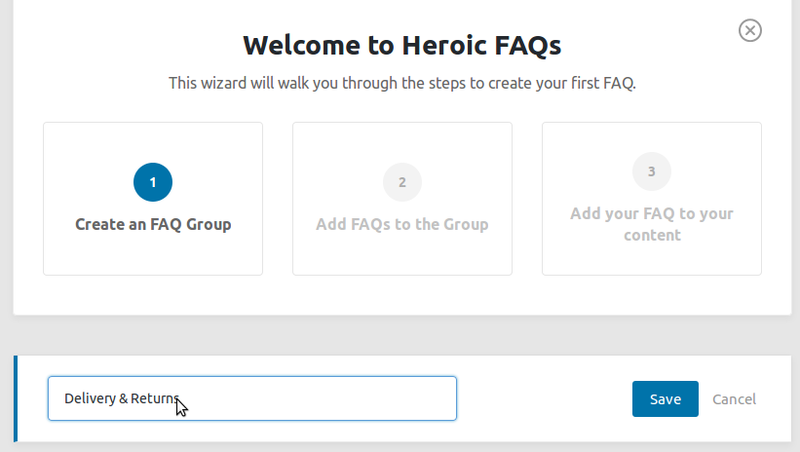 With the Heroic FAQ Block selected you can choose your FAQ Group from the Block detail screen on the right. 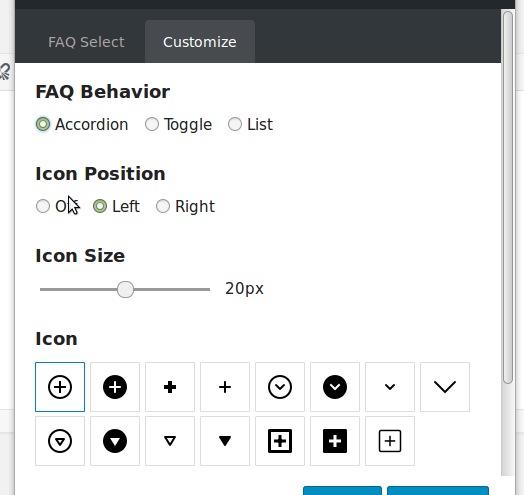 You can also select various pre-defined styles and further customize the FAQ display with behavior, icon select, style and color options. When you change an option, the preview is updated, so you can experiment with display options before publishing or updating your content. 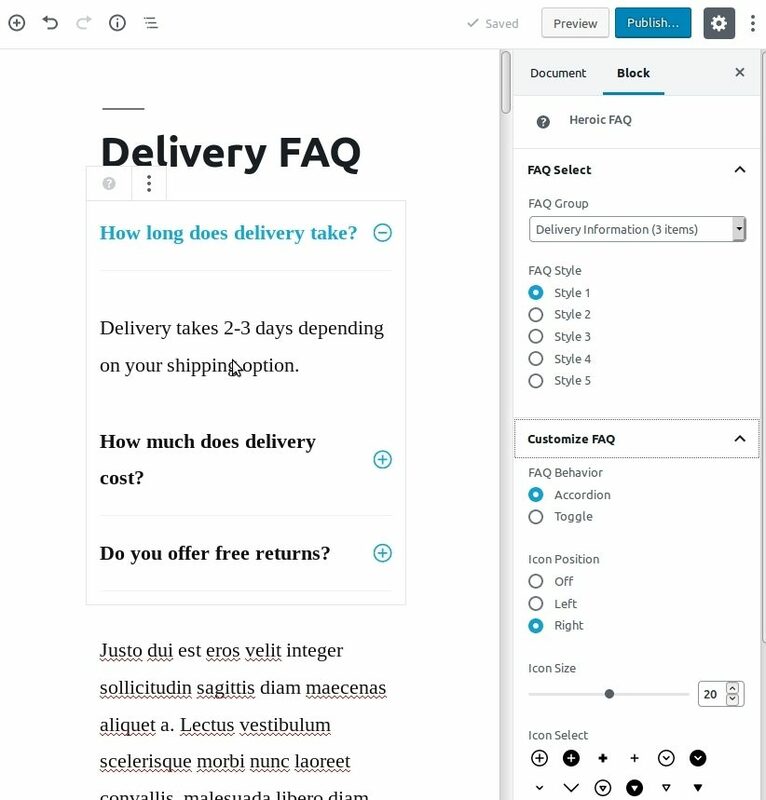 Because FAQ Groups can be used in multiple locations on your site, the editing of the FAQ content needs to be done in the FAQ builder discussed in the section above. 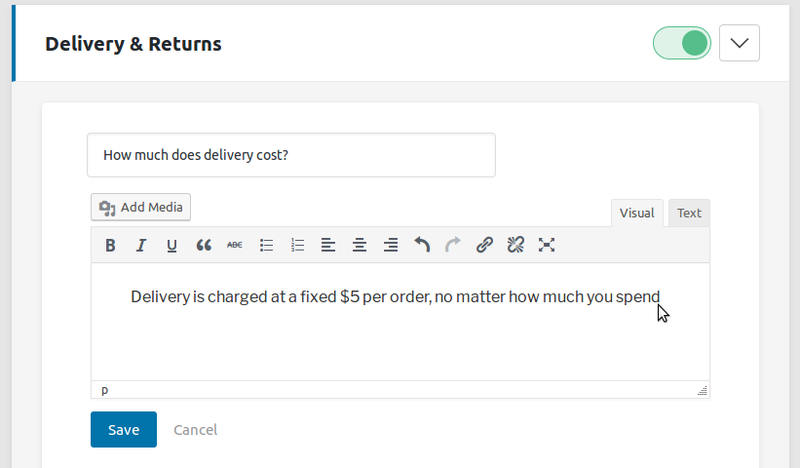 FAQs can also be added to content using the Add FAQ button above the WordPress classic editor. The shortcode can be used in classic blocks. The FAQ select dialog will appear, allowing you to select an FAQ Group and how it will be presented in the FAQ Select tab. Note that the name and number of FAQ items in the group may change but the shortcode will be unaffected. Click preview or save the content to see how the new FAQ looks. It is possible to manually alter the Heroic FAQs after use by altering the parameters.